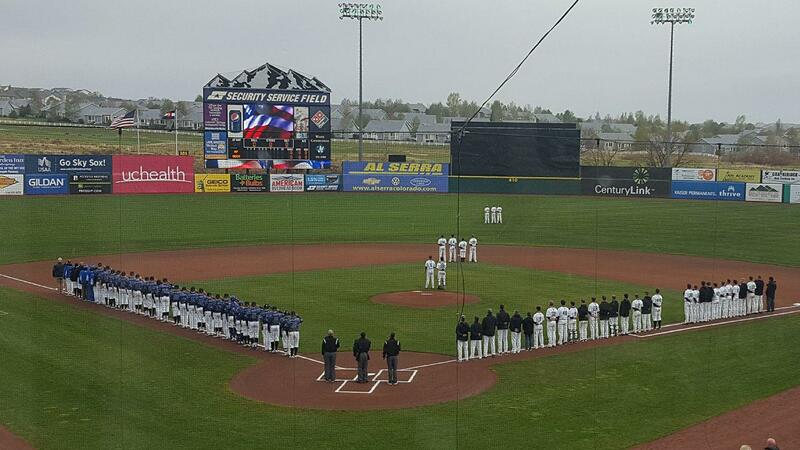 UCCS and Air Force stand for the National Anthem May 2, 2017 at Security Service Field. The UCCS baseball team will host Metropolitan State University ofDenver for the Rocky Mountain Vibes’ STEM Day at noon April 18 at Security Service Field. Different STEM partners such as Challenger Learning Center, Space Foundation, Cool Science and the UCCS Hyperloop team will host interactive exhibits around the ballpark. The Vibes’ Fun Zone will also be open for tons of games and activities during the ballgame. Gates open at 9 a.m. with admissions to STEM Day and the Mountain Lions game priced at $5 per ticket. Groups looking to attend the game can RSVP with Josh Preli at (719) 304-5624 or at jpreli@vibesbaseball.com. Along with the $5 tickets, $5 meal vouchers as well as $5 Unlimited Fun Zone passes are available through the group reservations. The Mountain Lions and Roadrunners will play out the rest of the series at Mountain Lion Park with a doubleheader April 19 and a single game April 20. Both days will begin at noon. MSU Denver leads the conference with a 16-4 Rocky Mountain Athletic Conference record and is 23-9 overall. UCCS is tied for third at 13-7 in the conference and 21-13 overall. It’s the second time UCCS will play a game at Security Service Field. The Mountain Lions hosted the U.S. Air Force Academy May 2, 2017, during the inaugural season. The Rocky Mountain Vibes begin its first season June 14 at the Orem Owlz and open at home June 21 with the Grand Junction Rockies. It’s the first season as the rookie-advanced affiliate of the Milwaukee Brewers in the Pioneer League.